CIA soldier Roger Ferris has come out of Iraq with a shattered leg and an intense mission— to penetrate the network of a master terrorist known only as "Suleiman." Ferris's plan is inspired by a masterpiece of British intelligence during World War II: He prepares a body of lies, literally the corpse of an imaginary CIA officer who appears to have accomplished the impossiblCIA soldier Roger Ferris has come out of Iraq with a shattered leg and an intense mission— to penetrate the network of a master terrorist known only as "Suleiman." Ferris's plan is inspired by a masterpiece of British intelligence during World War II: He prepares a body of lies, literally the corpse of an imaginary CIA officer who appears to have accomplished the impossible by recruiting an agent within the enemy's ranks.This scheme binds friend and foe in a web of extraordinary subtlety and complexity. When it begins to unravel, Ferris finds himself flying blind into a hurricane. His only hope is the urbane head of Jordan's intelligence service. But can Ferris trust him? Great read. David Ignatius keeps the story and suspense moving along while still developing the characters into human beings that I wanted to get to know better as the story evolved. When it comes to spy novels, David Ignatius is one of the best. His knowledge of his subject makes his stories ring true, including this one involving an attempt to draw out an Al Khaida mastermind who is wreaking havoc. As with most Ignatius novels, this one has unexpected twists and turns leaving a reader fully satisfied at journey's end.This really deserves a 3 1/2 star rating, but have not mastered the 1/2/ star designation. I saw the recent movie, and in comparison, the story in the book works much better. I like the way Ignatius spins the web of his spy novels, with generous helpings of the background knowledge of the Middle East from his time as a correspondent there, along with interesting plot twists. Even though I saw the movie, the story in the book is different enough that the development was surprising at times. I thoroughly enjoyed it! Excellent book. Ignatius really knows his stuff. Paints the CIA in a seemingly more realistic light, as a bureaucratic nightmare filled with careerist losers, much closer to how it's depicted in the other book that I'm currently reading (A Legacy of Ashes, The History of the CIA). I've seen the movie twice, and enjoyed it, but the book was better (of course). This isn't your usual run-of-the-mill spy novel where the noble American hero conquers all and the incompetent and lazy Arabs simply roll over and die. I found this book to be an intelligent deviation from the usual stereotypes. A refreshing read. An intricately woven scheme to deceive a deadly terrorist and lure him to come out in the open. But who is actually being outwitted? Who is running who? Is tech-intelligence greater than human espionage? David Ignatius strikes another home run with this one! This is a interesting enough novel but the plot is a bit too predictable at times. I haven't yet read "The Man Who Never Was" but I suspect the non fiction account of Operation Mincemeat has this novel beat. Ein Buch, das nicht mit großer Action, sondern eher mit unterschwelliger Spannung und Kriegführung daherkommt. Yay! An Ignatius book with a happy ending! I thought this one was terrific. Great plot. Thought I had guessed what was going to happen, only to be surprised by the turn of events. Not sure why authors always feel the need to include lewd material. It never adds anything to the book. If not for that it would have gotten 4 stars. Excellent book! Liked it as much as movie even that movie doesn't correspond 100% to the book. 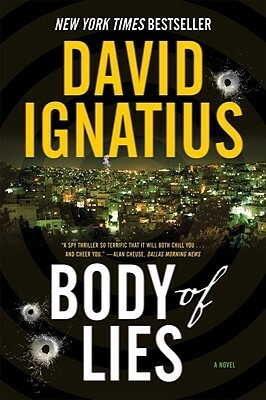 Recommend to everyone who likes spy thrillers and especially Middle East.